The Huskies men's hockey team salutes the fans at the Rutherford Rink. Believe it or not, there were times this season I was scared with a paralyzing fear about to going to the Rutherford Rink. When I was there, I didn't want to be anywhere else on during the 2014-15 Canadian Interuniversity Sport hockey season. For those that follow my posts on Twitter, they know I have battled with issues regarding anxiety. I went public with this realization when I discovered it in late 2012. My battles with anxiety were one of the 30 reasons that went into a big decision I made with my family. I would move away from my home of 10 years in Medicine Hat, where I had no family members, to Saskatoon, which contains a large number of relatives from my mom's side of the family. 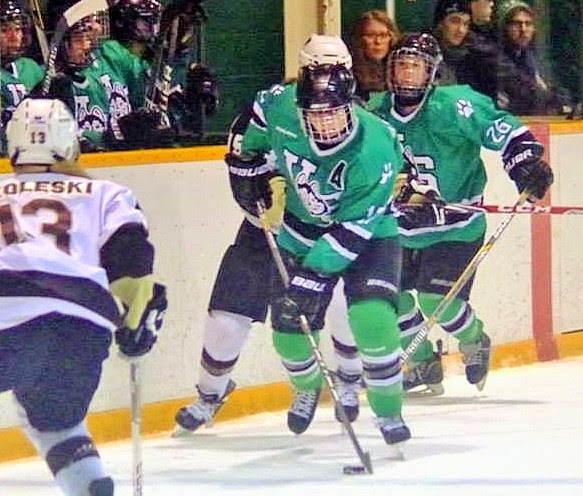 When I arrived as a permanent resident in late July, I had my heart set on going to most of the home games involving the University of Saskatchewan Huskies men's and women's hockey teams. I big time thank the players and staffs of both teams for being good about me being around the rink writing blogs and taking pictures. As the season went on, I really feel I got better with a lot of my issues on the anxiety front. The members of the Huskies men's hockey team know my story the best. I met most of those players through my time covering the WHL as a beat writer, which included covering the Medicine Hat Tigers for 10 seasons. I have long friendships with former Huskies captain Brennan Bosch, who graduated after last season, and goaltender Ryan Holfeld, who played his final game with the Huskies last weekend. Both were former members of the WHL's Tigers, and they know my story fairly in depth. When I was in Saskatoon on a medical leave in November of 2012, I visited with them at length regarding how I ended up in the situation I was in. I have always felt extremely safe in my friendships with them, but I never envisioned leaning on them in this way. I later discovered Holfeld's brother, Troy, has had battles with anxiety and depression, which I think also helped when I talked with the veteran netminder about my anxiety issues. The Huskies women's team salutes the fans at the Rutherford Rink. I watched Bosch and Holfeld play with the Huskies on about four different occasions on visits from Medicine Hat. Through the Huskies men's team, I started meeting players from the Huskies women's hockey team. I watched them win their first Canada West title on March 2 of last year with a 2-1 double overtime victory over the U of Regina Cougars. Those visits were always so good for me, because I arrived at the rink just to watch the Huskies play without any worries about covering the game. I enjoyed going to games again, and some of that love of just going to the games was lost in my final years in Medicine Hat. While I worked with great people in the Hat at the Medicine Hat News, my troubles developed thanks to changing stresses in the workplace that affected everybody. As a result, the joy I had in going out to cover events wasn't always there. When I started watching Huskies hockey home games as a Saskatoon resident, there were a number of times my sense of anxiety would heighten, and I did not expect that would happen. I was always fine when the games themselves were in progress, but I did have shaky moments before and after the games. The first moment of slight fear came from actually encountering players from the Huskies women's team. The player I knew the best was Cami Wooster, who was the team's captain in the Canada West championship season, and she had graduated and was no longer around. She knew about my battles, but the other players didn't. I had a bit of a fear the players would look at me as being some sort of weak person or a life failure due to what happened to me. Marley Ervine and Brooke Mutch were two remaining players from the 2013-14 season I talked with a bit in the past. When I saw them for the first time this past season, I made sure to tell them my anxiety story. I always felt it was best to be up front with this. Goaltender Ryan Holfeld gets set in the Huskies' net. I also thought their coaches had to be concerned that their players were befriending this dude that has had battles with mental health. All good coaches constantly worry about their players, but I have long ago learned it is more of a good type worry. The only coach I had dealt with before this season was assistant coach Julie Paetsch and those meetings occurred during a couple of social occasions involved with the Saskatoon Valkyries women's football team. As the season went on, I got to meet and befriend more of the players and staff from Huskies women's team, so those fears went away. At first, I only went to the Huskies games to watch. I then started to write blog posts. After I purchased a new digital SLR camera body, I began taking pictures and posting them on Twitter. As I became more comfortable, I would get brave and experiment with doing some of the things I would normally do once again. I would still have weird other type fears come out of nowhere. In November, I almost stopped straight out going to games. Out of the blue, I had this fear people would see me as this sad old sports reporter that was trying to hold on to a past life and should forget about writing blog posts or shooting games. My mind would reason only few people cared about what was going on with the Huskies hockey teams as the men's team would average just over 600 spectators per game and the women's team attracted about 200 spectators per game, who were mostly family and friends. It was far from what seemed like the endless amounts of people that gave their opinions on the three different WHL teams I covered over 15 seasons. When I was at the Rutherford Rink, all those fears were gone. Brooke Mutch follows through on a shot for the Huskies. Also, a couple of other turning points helped in November. I ended up going out with the Huskies men's team on a social occasion during a time my mind was really troubled, and that helped a lot. I also learned the players on the women's team really liked the action pictures I took of them, and that really raised my spirits. As the second semester arrived, the road blocks in my mind weren't showing up. I decided that if I enjoyed going to the games I would keep going to them. If I enjoyed writing the blog posts and taking pictures, I would keep doing those things. Flat out, I just liked being there. I was feeling like my normal self throughout all of game day again. At the start of the week, I actually began looking forward to going to games on Friday and Saturday nights on a consistent basis again for the first time in years. The friendships I was making at the rink were helping me get better. I know in my life I will always have to deal with anxiety in some way, but you have to try and keep making baby steps every day. Thanks to the relationships I developed with the Huskies hockey teams, I believe I made a lot of baby steps in the 2014-15 season. Day to day, I feel like myself again on a more consistent basis. If you have any comments about this blog, feel free to email them to stankssports@gmail.com. Huskies goaltender Ryan Holfeld gets focused for action. Ryan Holfeld did all he could do to extend his CIS career to another weekend. 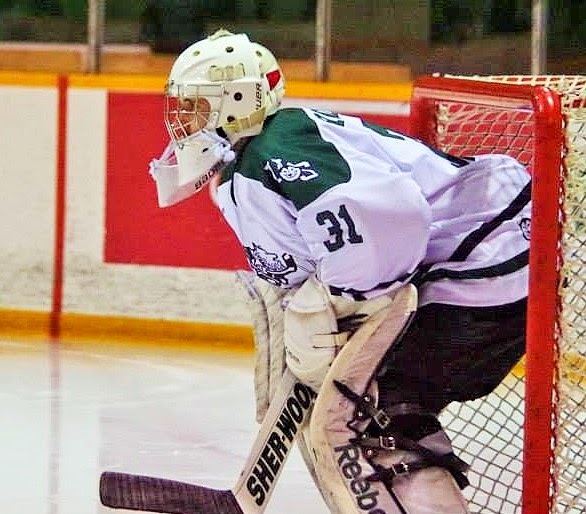 As has been the case a number of times this season, the University of Saskatchewan Huskies men's hockey team couldn't score enough goals to support him. On Sunday night at the Flames Community Arena in Calgary, Holfeld was once again in net for the Huskies this time in a deciding Game 3 of a Canada West quarter-final series against the Mount Royal University Cougars. The fifth-year netminder kept making save after save and finished the contest making 41 stops in total. As far as the scoreboard was concerned, the effort went for naught. The Huskies were unable to score and fell 3-0 to bring their 2014-15 campaign to an end. Cam Lanigan made 23 stops in the Cougars goal to pick up the shutout. In defeat, Holfeld was once again heroic. He again gave his Huskies every opportunity to earn victory. His teammates paraded to the penalty box allowing the Cougars to have 15 power-play chances. Holfeld, who stands 5-foot-11 and weighs 185 pounds, only surrendered one goal on those chances, and it likely should have been more. Playing like a focused pro, he wouldn't let the game get away from his squad. This past weekend, Holfeld left one last big memory over three games of work to once again show just how amazing he could play in goal. He stopped 100-of-108 shots fired his way for a .926 save percentage and a 2.66 goals against average. In Game 1 of the series Friday in Calgary, he made 25 stops through regulation as the Huskies and Cougars played to a 1-1 draw. MacKenzie Johnston gave the Cougars a 1-0 lead in the first period, while Sean Aschim netted the equalizer for the Huskies in the third. The Huskies dominated play in the final frame of regulation outshooting the Cougars 14-3. During the regular season, the Dogs scored the third fewest goals in the eight-team Canada West Conference, and their struggles around the net were showing up again. Just 36 seconds into overtime, Holfeld was beaten by Cougars forward Matthew Brown on the first shot of the extra session to help the hosts skate away with a 2-1 win. Once again, the netminder had to suffer through a heartbreaking loss. His Huskies arguably had what would be their best outing of the series as Lanigan made 31 stops to pick up the win. Ryan Holfeld makes a stop in goal for the Huskies. In Game 2 on Saturday in Calgary, Sebastien Pare gave the Cougars an early 1-0 lead. Before the opening 20 minutes finished, the Huskies finally had an offensive spark going up 3-1 with singles coming off the sticks of Jesse Ross, Zak Stebner and Connor Cox. Overall, the Huskies scored three times on five shots in the first. The visitors played a strong second, but the Cougars came out with a whole pile of pressure in the third. Pare would net his second of the contest, and Emerson Hrynyk tied the contest up at 3-3 with 7:20 to play in the stanza. From there, the Holfeld kept the Cougars at bay, and the Huskies were able to stave off elimination. With 29 seconds to play in the third, rookie forward Michael Sofillas scored to give the visitors a 4-3 victory, which ended a six game skid including the regular season and playoffs. Holfeld made 34 stops to earn the win. Lanigan turned away 23 shots in goal for the Cougars. The series and the battle between two former members of the WHL's Medicine Hat Tigers was tied 1-1. As it turned out, the OT loss in Game 1 was the one that got away for the Huskies. In Game 3 on Sunday, Tyler Fiddler scored 30 seconds into the first to give the Cougars a 1-0 lead. They outshot the Huskies 26-6 in the second and added two more goals on singles from Jamie King and Tyler Jewitt. The Cougars were on their way to face the Calgary Dinos in a best-of-three Canada West semifinal series this coming weekend. Holfeld's career was left to tick away. The 25-year-old LeRoy, Sask., product goes down as one of the best goaltenders the Huskies men's program ever had. In the regular season, he finished with a 53-34-2 record, a .919 save percentage, a 2.43 goals against average and eight shutouts. His 2,452 career saves in regular season play is a record for the Huskies men's team. During the 2014-15 regular season, he split time in goal with rookie Jordon Cooke, who came off a stellar WHL career with the Kelowna Rockets. The Huskies posted their first losing record in 19 years with a 10-15-3 mark due in large part to their goal-scoring struggles. Holfeld was still sensational recording a .922 save percentage, a 2.42 goals against average and one shutout in posting a 5-8-1 record. In his first four seasons at the U of S, the Huskies never finished lower than third in the Canada West standings. While those Huskies teams had a larger number of high end forwards, Holfeld did steal his share of games. Ryan Holfeld (#31) gets congratulated after a win in early Jan.
Due to mostly being made up of graduates of the major junior and junior A ranks, the players in Canada West are good at critiquing their own performances, and when Holfeld stole a win, there were a lot of players telling him thank-you afterwards, while vowing to play better going forward. He was key in helping the Huskies win a Canada West title in 2012. Away from the rink, Holfeld endeared himself to his teammates and players on other Huskies teams for being a comedian that would say the most humourous things out of the blue. He also knew when it was time to be serious and was the teammate others could confide to, if they were having troubles in their lives. Holfeld also excelled in the classroom, which allowed him to be accepted into law school after his third year with the team. Over the past two seasons, he was usually busy studying, when he wasn't at the rink. He was still able to squeeze in time to visit with family and friends for short periods after games. For all that he was able to do in his five seasons with the Huskies, it would have been nice if he could have gotten one more series win. 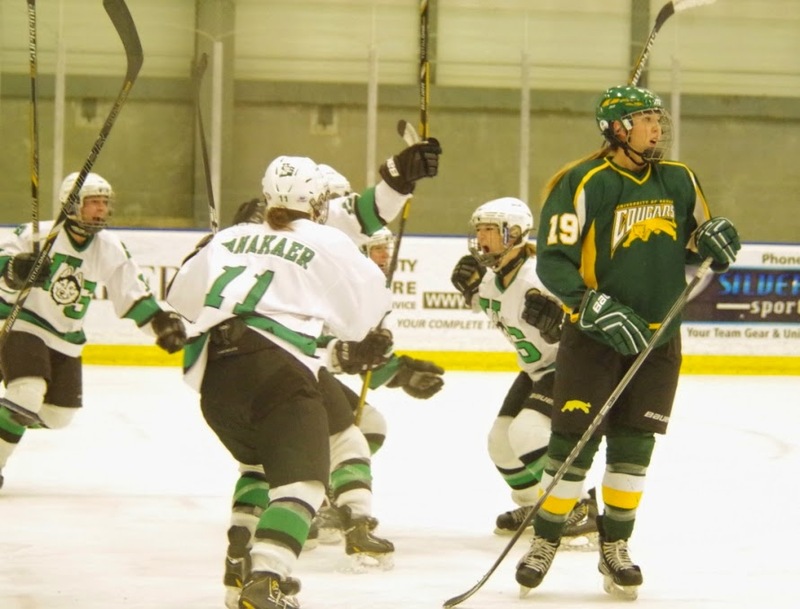 On and off the ice, he will always be viewed as one of most proud success stories of the U of S athletic program. Huskies forward Kandace Cook inspired with her heart and determination. Winning a championship is hard and repeating as champ is even harder. 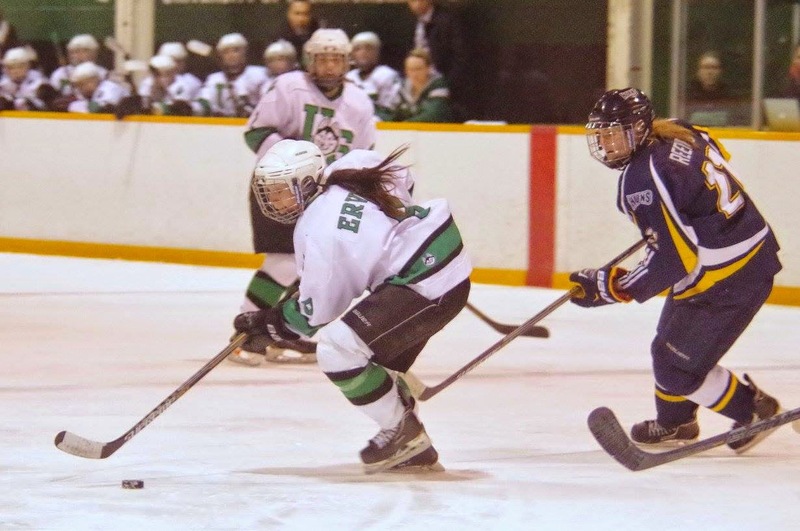 The University of Saskatchewan Huskies women's hockey team learned how true that statement is. Their 2014-15 campaign officially came to an end on Saturday, when they were swept out of the Canada West playoffs by the U of Calgary Dinos. The Dinos claimed a best-of-three quarter-final series 2-0 thanks to a 5-1 victory on Friday and a 3-2 win on Saturday in Calgary. The Dogs season wrapped up about a month earlier than it did a year ago, when they won their first Canada West title and a bronze medal at the Canadian Interuniversity Sport championship tournament. The medal win at nationals was also a first for the program. Entering the 2014-15 season, the Huskies returned a large number of players from that championship squad. Even with the returnees, the majority of pre-season predictions had them finishing around third in the conference. As far as the team went, hopes were high that the accomplishments from 2013-14 could be matched or improved upon. The Huskies built an 11-3-2 record to sit first overall in Canada West heading into the Christmas break. They started the second semester getting swept by the Dinos in Calgary dropping two games by a combined score of 9-3. The players on the U of S squad admitted they weren't very good in those outings. The result seemed to set a tone for the semester, as those setbacks were the start of a seven-game skid. Over the final five regular season games, the Huskies showed signs of coming out of their funk posting three wins to finish at 14-10-4 good for fifth overall in Canada West. Their confidence appeared to have returned heading into the post season. Huskies defensive forward Chelsey Sundby was a heart and soul player. Just 61 seconds into Game 1 of their quarter-final series with the Dinos, Janelle Parent scored to give the hosts a 1-0 lead. Erika Mitschke scored on a power play just under six minutes late to increase the Dinos' lead to 2-0. Parent added her second of the game in the second, and Bronwyn Stevens and Iya Gavrilova potted singles to give the host a 5-0 lead at the 4:43 mark of the third. Following the fifth goal, the Huskies pulled starting netminder Cassidy Hendricks, who stopped 25 of 30 shots fired her way. Jerrica Waltz turned aside all five shots she faced in relief. Carissa Fischer made 24 saves in goal for the Dinos and her bid for a shutout was stopped thanks to a third period goal by Huskies defender Kira Bannatyne in the 5-1 final. In Game 2 on Saturday, Jenna Smith put the Dinos up 1-0 in the first, but standout sophomore Kaitlin Willoughby potted the equalizer for the Huskies to knot things up at 1-1. Gavrilova put the Dinos up 2-1 before the second period ended, and Smith added her second of the contest early in the third to put the hosts up 3-1. Canada West first team all-star defender Julia Flinton scored with under a minute to play in the third to pull the Huskies to within 3-2. The Dogs couldn't net the equalizer in the final seconds. Hendricks made 26 saves in the loss, while Fischer made 17 saves in the win. A lack of scoring depth proved ultimately to be the biggest thing that hurt the Huskies in the second semester. Forward Rachel Johnson was lost with a knee injury during a Jan. 16 home contest at the Rutherford Rink, where the Huskies dropped a 1-0 decision to the University of British Columbia Thunderbirds. Rookie forward Chelsea Wilson left the team due to family reasons having last played in a 5-2 road loss to the Dinos on Jan. 10. When those two players were playing in the first semester, the Huskies had an easier time creating offence. After they left, the Huskies became essentially a one-line team offensively relying on the forward unit of Willoughby, fifth-year forward Kandace Cook and Marley Ervine for goals. 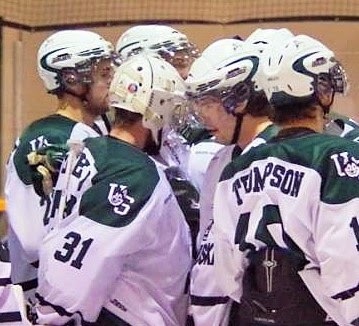 As a whole, the Huskies scored 58 goals over their 28 game regular season, which ranked sixth in the eight team Canada West. The graduation of Cami Wooster, who was the captain of the Canada West title team, also was a big blow when it came to offensive production, as she led that club with 16 goals and 31 points. 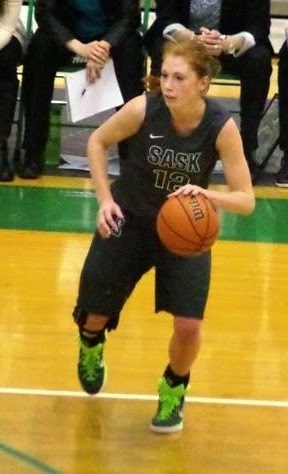 Defender Julia Flinton was a first team Canada West all-star. Besides the difficulties with putting the puck in the net, the Huskies also went through a lot of stretches in the second semester where they had trouble breaking out of their own zone, when opponents were in hard on the forecheck. When next season rolls around, the Huskies will be without Cook and fifth-year forward Chelsey Sundby due to graduation. Cook had a breakout year offensively with career highs in goals (13) and points (22). Sundby, who is more of a defensive forward, picked up a career high five goals this season and matched her career high in points with seven. Both were heart and soul members of the team, whose compete level was always high game in and game out. They will be missed going forward. The Huskies will return a key base of players, but they need to find recruits at forward to help them on the offensive end of the rink. They can build around players like Willoughby, who had 10 goals and 16 assists for a team high 26 points. It is possible players currently on the roster could have breakout seasons in 2015-16 with another year of experience under their belts. While the way the 2014-15 campaign finished was far from what the Huskies envisioned, the returning players should still shoot for the bar that was set in the 2013-14 Canada West title season. The first CIS title for women's hockey was awarded in 1998, and since that time, the Huskies have only won one conference title. When the 2014 Canada West title win happened, it was really special for all those involved. The players that continue to wear the Huskies jersey in the future should strive to one day experience that same feeling and maybe one day exceed that with a first national title win. Riley Humbert drives with the ball for the Huskies. It almost feels like an annual expectation. 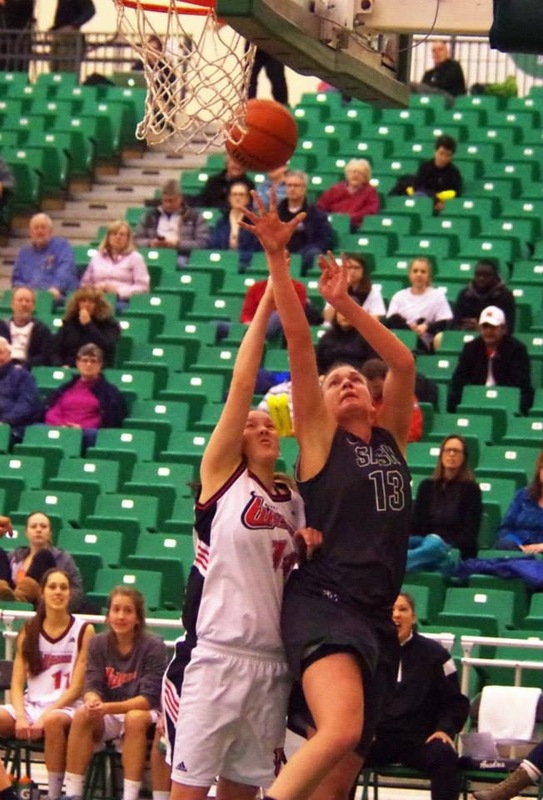 The calendar is going to turn to March and the University of Saskatchewan Huskies women's basketball team will once again be part of the monthly playoff madness. The Huskies punched their ticket to the Canada West Final Four for the seventh time in 10 years sweeping the U of Winnipeg Wesmen in a best-of-three quarter-final series 2-0 at the Physical Activity Complex. 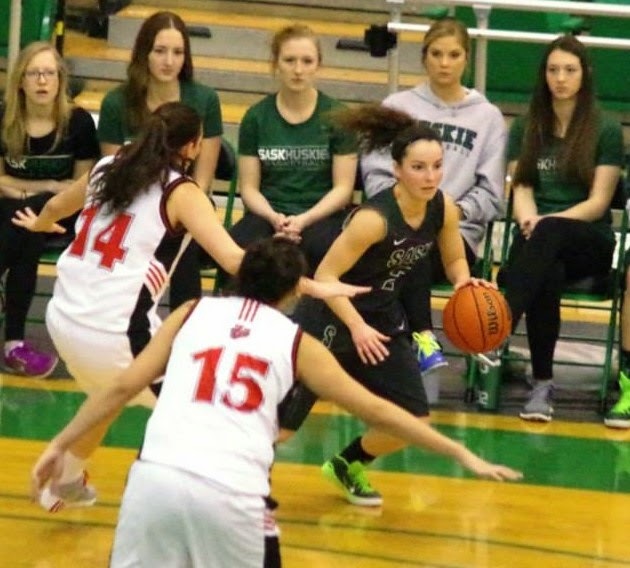 U of S claimed a 71-47 victory on Friday and a 73-57 triumph on Saturday thanks to a nice fourth-quarter surge. After starting the season at 4-3, the defending Canada West champs are currently riding a 15-game winning streak including action in the regular season and playoffs. During the run, they playing a well-rounded game, where everyone is finding ways to contribute to the success. While the Huskies have been a powerhouse team, there have been a lot of times in the past where they would tend to rely on fourth-year star post Dalyce Emmerson. Actually, the joke with anyone around the team was that when things go bad just pass the ball to Dalyce, and she will score. To her credit, Emmerson, who stands 6-foot-3, is one of those once in a generation talents, and it seemed like she would always score no matter what defence she faced. It almost seemed senseless not to get her the ball. She is huge at pulling down rebounds on either end of the court. With having someone as good as Emmerson on your side, you do develop a danger of relying on her too much, even if your team is loaded with other good players. Dalyce Emmerson goes for two for the Huskies. At the start of the season, Emmerson was hampered by some nagging injuries, but she was still able to play. When she wasn't at 100 per cent, the other players on the Huskies stepped up to help carry the load. That continued to be evident during the sweep of the Wesmen. Emmerson, who is healthy, was a factor in those victories, but she wasn't the dominant force. The Huskies, who were 17-3 in the regular season, had their biggest contributions offensively come from their guards. In Friday's 71-47 victory, fourth-year guard Kelsey Trulsrud led the way with 21 points, and she also pulled down nine rebounds. Third-year guard Desarae Hogberg came off the bench to finish second in team scoring with 10 points. Emmerson was still part of the action leading the club with 16 rebounds, but she only had to attempt six shots from the floor thanks to the other contributions. She made four of those shots and finished with eight points. In Saturday's 73-57 win, fifth-year guard Riley Humbert fired down three-point shots like she was a secret character in the 1990s video game NBA Jam. She nailed a remarkable 8-of-11 shots from beyond the arc and led the Huskies with 24 points. Fourth-year guard Laura Dally and Trulsrud added 14 and 12 points respectively. Emmerson topped the Huskies with 13 rebounds, while chipping in five points and three assists. In the series clinching win, the Huskies pushed out to about a 10-point lead on a few occasions, but the Wesmen, who were 14-6 in the regular season, would force a tie score hitting a number of three-point shots of their own. The contest was tied 29-29 at halftime, and the Huskies held just a 52-48 edge after three quarters. When things got tough in past seasons, the ball would go inside to Emmerson to force a momentum change. On Saturday night, the Huskies guards responded with big shots to regain the upper hand. The host started the fourth quarter on a 9-0 run to go up 61-48 and cruised to the win from there. Entering the series, the Wesmen came in riding an eight-game winning streak of their own, so they were a formidable foe. Kelsey Trulsrud controls play for the Huskies. The Huskies ball movement offensively and the success they had scoring outside and inside kept the visitors off balance. The players also benefit from the fact they are guided by head coach Lisa Thomaidis and assistants Jacqueline Lavallee, Alison Fairbrother and Jill Humbert, who together are one of the top three staffs if not the best staff in the women's game in Canada. Going forward into the Canada West Final Four, the Huskies will be tough to beat. They could end up hosting the Canada West Final Four set for March 6-7, if the University of British Columbia Thunderbirds get upset by the U of Regina Cougars in a best-of-three quarter-final series this coming weekend. 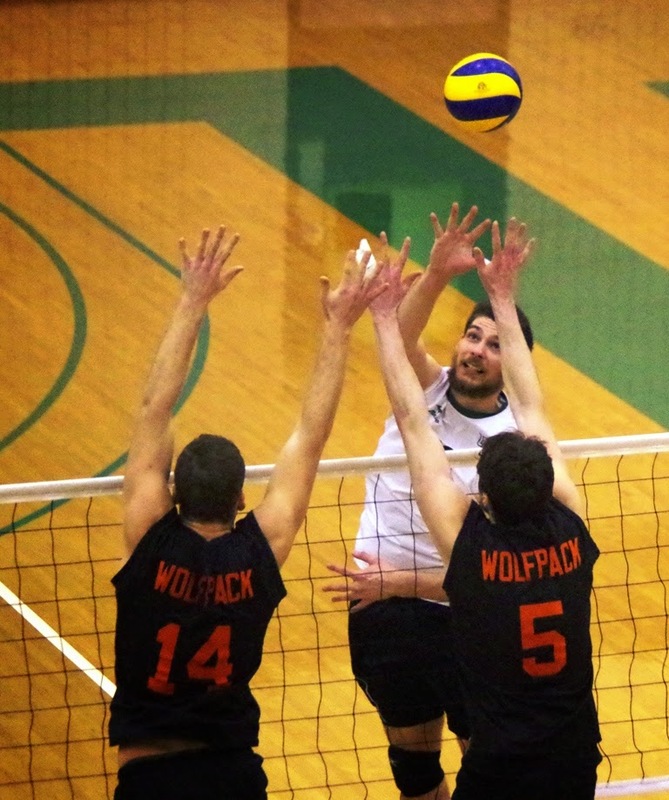 U of S got its series in early to lessen the scheduling stress due to hosting the Canadian Interuniversity Sport men's volleyball championship next weekend at the Physical Activity Complex. The Huskies will also soon start encountering single-elimination game type situations, which always makes playoff basketball compelling and unpredictable. With that said, all they have to do is win five more straight games to win the first ever CIS title in the history of the program. In all reality, the Huskies are now a short distance away from accomplishing the one goal that has eluded them. Achieving that goal would make for a sweet finish. NOTE -- Guard Kaylee Halvorson was sitting on the Huskies bench supporting the team in her street clothes on the weekend. Halvorson tore the anterior cruciate ligament in her right knee just over a year ago. Her venture along the comeback trail has been plagued by a few setbacks. With that in mind, it was encouraging to see her with the team. Halvorson, who stands 5-foot-11, had been part of Canada's national team program, and her injury prevented anyone from seeing how good she could be. She still has three years of eligibility remaining to play with the Huskies. If you have any comments about this blog, feel free to email comments to stankssports@gmail.com. Goaltender Ryan Holfeld makes a paddle save for the Huskies. They might be on the road to open the post-season, but it wouldn't be a shocker if both University of Saskatchewan Huskies hockey teams were back at the ancient Rutherford Rink next week hoping a rust break doesn't disrupt practice. Both Huskies teams are in Calgary to open the Canada West playoffs in respective best-of-three quarter-final series. The Huskies men's team, who were 10-15-3 in the regular season, battles the Mount Royal University Cougars (17-10-1). The Huskies women's team, who were 14-10-4 in the regular season, takes on the U of Calgary Dinos (14-9-5). Game 1 of each series is set Friday, Game 2 follows Saturday, and any Game 3s, if necessary, will be held Sunday. During the regular season, similar themes emerged from both Huskies squads. Both had struggles putting the puck into the net, but strong goaltending and defence always made victory possible each time they hit the ice. In the men's Canada West playoffs, the team that succeeds will be the one the shakes off the rust the quickest. At the Winter Universiade that recently wrapped up in Granada, Spain, Canada's men's team, which won a bronze medal, was made up entirely of players from Canada West. Due to that fact, the Canada West men's league has gone through three off weeks between games. As a result, any positive momentum up swings or slumps that were suffered as the regular season came to a close are now pretty much irrelevant. The biggest challenge the coaching staffs on each squad had was keeping the players engaged at practice as much as possible as the off time dragged on. A team can only practise for so long before you pretty much have to have a game. It is just human nature. The Cougars claimed three of four regular season encounters against the Huskies. Two of those Cougars wins were by a one-goal margins, and both came at Mount Royal. 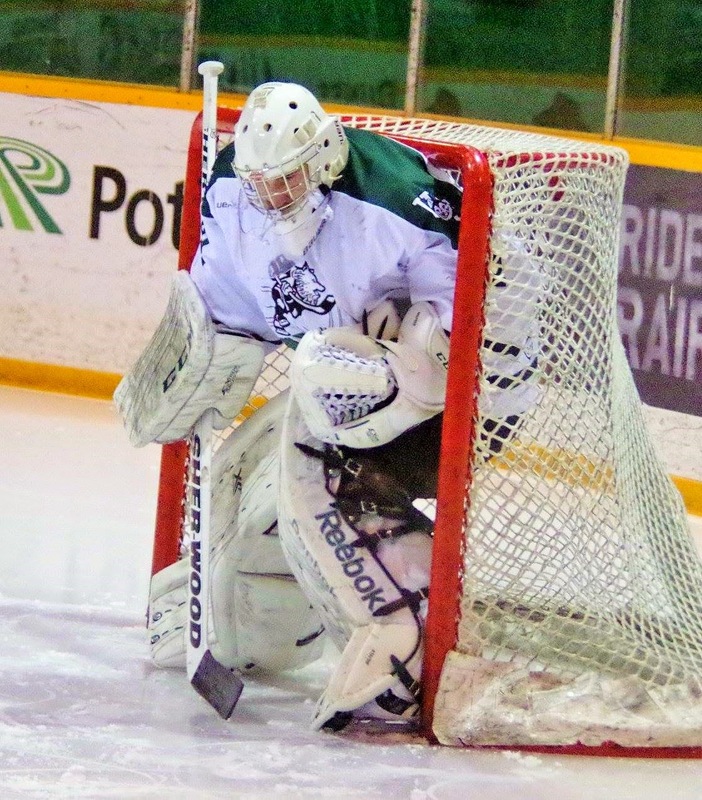 The Huskies have platooned goaltenders Ryan Holfeld and Jordon Cooke throughout the regular season. Holfeld had a 2.42 goals against average and a .922 save percentage, while Cooke had a 3.13 goals against average and a .905 save percentage. Both also had one shutout each. The Dogs won't go wrong with whoever they put in goal. As far as intangibles go, it would be nice if they give Holfeld the nod to start and carry the load in the series. The fifth-year veteran is playing the final games of his Canadian Interuniversity Sport career, and the likelihood is high he will go out playing in spectacular fashion. In his final regular season start back Jan. 29, Holfeld, who is in law school, was absolutely magical making 48 saves in regulation and two overtime periods and turning away five of six shooters in a tiebreaking shootout in a 2-1 setback to the U of Alberta Golden Bears. It might have been the best individual performance seen this season at the Rutherford Rink. Josh Roach speeds up ice for the Huskies. While they haven't scored a lot, the Huskies do have enough offence to get the job done in a short best-of-three series. Fifth-year forward Craig McCallum is their most dangerous offensive player having led the team in scoring with 12 goals and 14 assists. Second-year forward Josh Roach has become a key set-up man finishing second in team scoring with six goals and 16 assists. 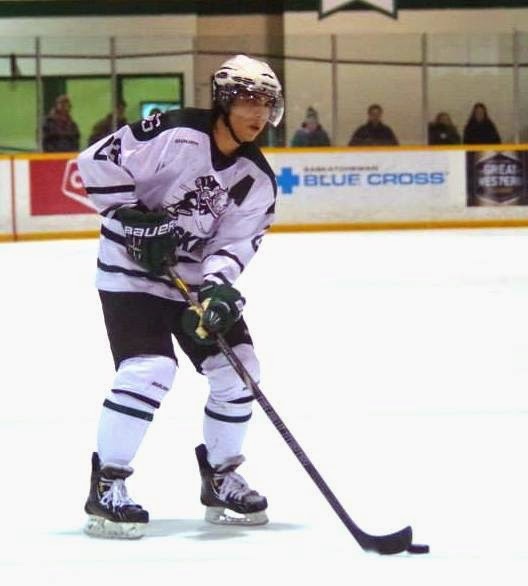 Cody Cartier led the Cougars in scoring with 14 goals and a Canada West best 25 assists. Dalyn Flette and Cam Lanigan split time in goal for Mount Royal. Flette had a 2.36 goals against average and a .924 save percentage, while Lanigan had a 2.54 goals against average and a .915 save percentage. On the women's side, the Huskies closed the regular season winning three of their last five games. That included wrapping up the regular campaign with a 2-1 victory over the U of Regina Cougars last Saturday at the Rutherford Rink. Over that stretch, the Huskies started to play a lot more sound in their overall team game. That was a key aspect that allowed them to win the Canada West title a year ago, and helped them sit first in Canada West conference going into the semester break. They dropped to fifth in Canada West after starting the second semester on a seven-game losing streak. Cassidy Hendricks had starred in goal all season starting 26 of 28 regular season games posting a 2.21 goals against average, a .926 save percentage and four shutouts. She has built a reputation as being a money netminder in key games in her three seasons with the team. The Huskies also return arguably their best player in offensive defender Julia Flinton, who helped Canada's women's team in a silver medal at the Winter Universiade. The smooth skating Flinton had five goals and nine assists in 23 regular season games with the Huskies. Standout sophomore Kaitlin Willoughby led the Huskies in scoring with 10 goals and 16 assists, while most team's best defensive forwards and defenders night in and night out. She finished sixth in scoring in the conference. Fifth-year forward Kandace Cook had her best season with the Huskies picking up career highs with 13 goals and 22 points. Her nine assists was the second highest total she posted in that statistical category in her career. The biggest story coming out of the Dinos camp was the fact they won't have Canadian hockey icon Hayley Wickenheiser in their lineup after having season-ending foot surgery on Wednesday. Kaitlin Willoughby zips up ice for the Huskies. The Dinos will still have Russian Olympic team members Iya Gavrilova and Alexandra Vafina in the fold. Gavrilova finished second in conference scoring with 21 goals and 16 assists in 23 games. Vafina played just seven games with the Dinos picking up one goal and one assist. Both helped Russia's women's team win gold at the Winter Universiade. Sophomore forward Janelle Parent was second in Dinos team scoring with 13 goals and 15 assists. Hayley Dowling had the majority of the starts in goal for the Dinos posting a 2.18 goals against average, a .912 save percentage and two shutouts. The two clubs slip their four regular season contests, with each side hold court on home ice. Wickenheiser played in all those matches. The Huskies seven-game skid to start the second semester began with two consecutive losses to the Dinos in Calgary by a combined score of 9-3. While those setback started a down stretch, the Dogs could possibly start a memorable playoff run with a series win in Calgary. Going into the series, it was visible the Huskies had their focus and confidence back, and those could be intangibles that help push them through the first round. One worry the Huskies have that they can't control is numbers. They have exactly 18 healthy skaters and two healthy goals, which will allow them to dress a full roster. If they encounter any more injuries, that will force them to skate with a short bench. Both Huskies hockey teams face big challenges, but they are ones that can be overcome. Nelson Nogier gets honoured by the Blades. It felt like Nelson Nogier jersey retirement night on Wednesday at the Sasktel Centre. The former Blades defenceman, who spent two-and-a-half seasons with the team, appeared in his first game at the Sasktel Centre since becoming a member of the Red Deer Rebels. 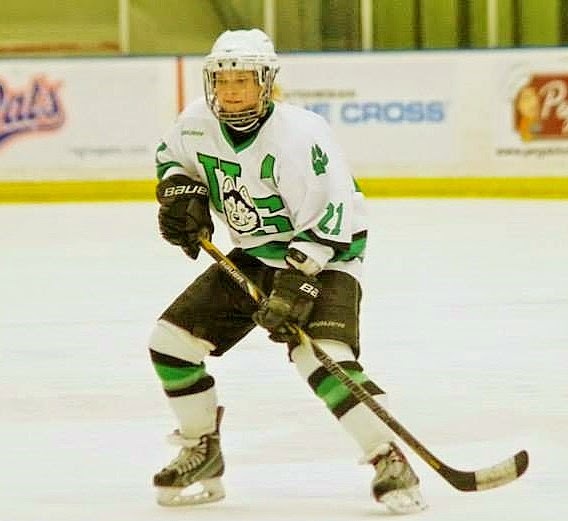 Shortly before this season's Christmas break, the Blades dealt Nogier and 18-year-old right-winger Austin Adamson to the Red Deer Rebels in exchange for 17-year-old winger Mason McCarty, a first round selection in the 2016 WHL Bantam Draft and a second round selection in the 2015 Bantam Draft. In his time with the Blades, Nogier was the poster boy team player, who was huge in representing the club in the community. He was also the WHL's scholastic player of the year last season. Before Wednesday's game, Nogier, who an NHL Entry Draft selection of the Winnipeg Jets, was honoured at centre ice. 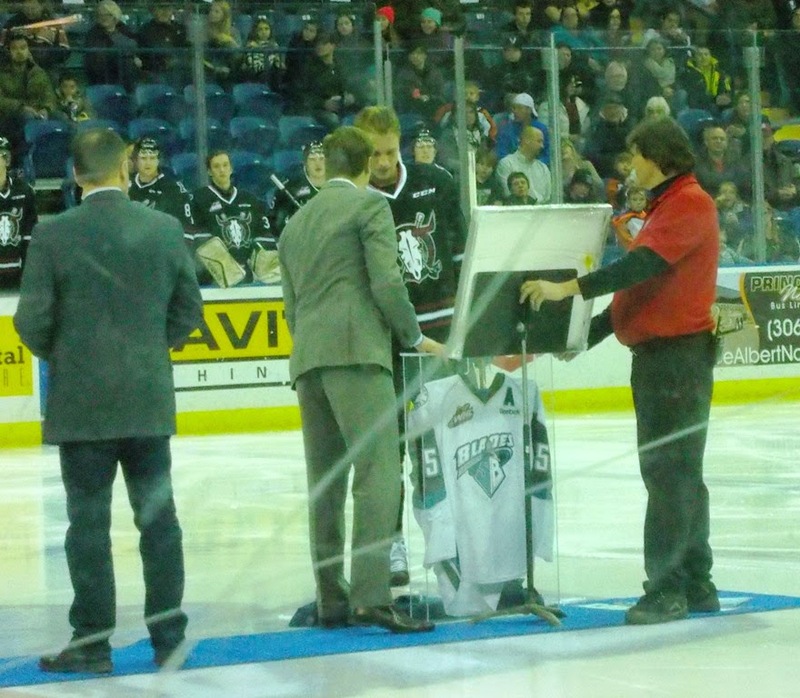 He was presented with his old game jersey in a glass case, an amazing looking framed action photo and he took the ceremonial faceoff against Blades captain and friend Brett Stovin. Nogier's father, Pat, dropped the puck for the ceremonial faceoff. The Blades also gave away 2,500 Nelson Nogier bobblehead dolls to the 4,479 spectators in attendance. Nogier's Rebels took the contest 4-3 on the strength of two late third-period goals. The Blades are rebuilding under a new owner Mike Priestner, and Wednesday's pre-game festivities were really first class. While hockey does have a business side to it, it is still nice a show a former player, who made all the right moves and carried himself well, that his time with the team was appreciated. That also sends a good message to any player looking to join the Blades that they will be appreciated and treated with respect, if they put in an honest effort with the team. Of course, Nogier is my young cousin and there was a large family presence at Wednesday's game. It is safe to say we were all pretty impressed with the pre-game festivities. My young cousin was pretty humbled by what took place. Overall, that was a pretty cool night, and it was too bad the game itself couldn't have ended in a tie. 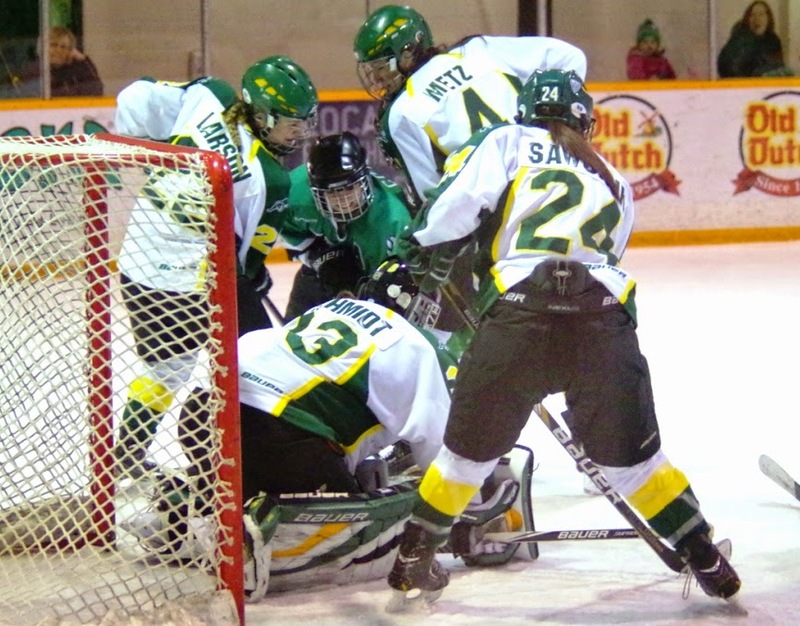 An army of U of R Cougars try to stop Kandace Cook of the U of S Huskies. The smiles and the good-natured personalities were back. 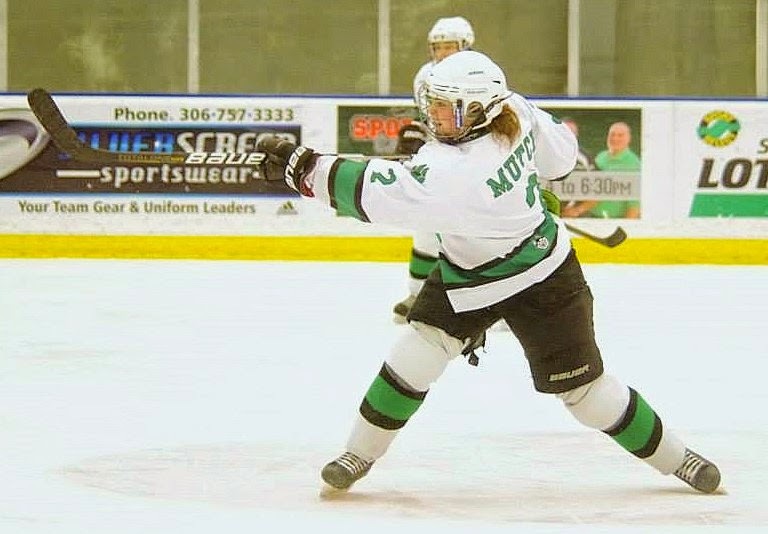 The players on the University of Saskatchewan Huskies women's hockey team are starting to look more and more like themselves. After starting the second semester with seven straight losses, the Huskies have won three of their final five regular season contests entering the Canada West Conference playoffs. 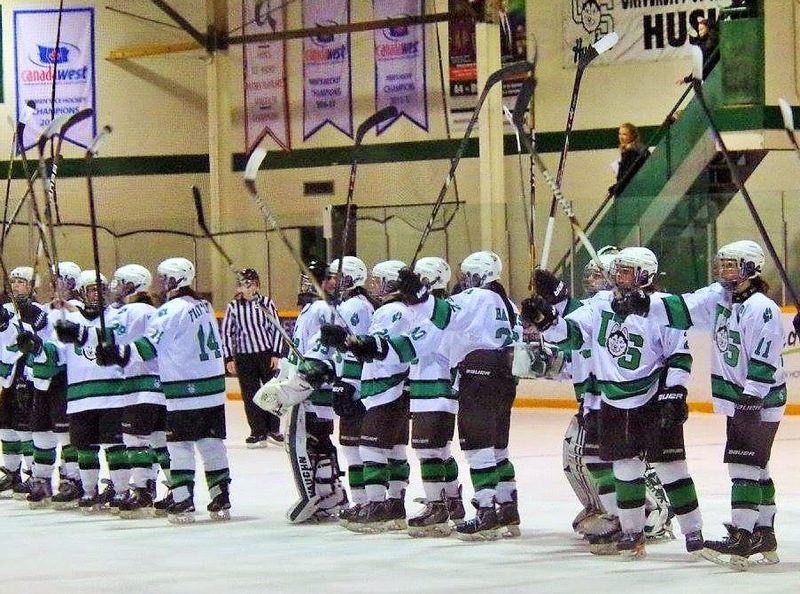 The Huskies closed regular season splitting a home-and-home series with the U of Regina Cougars. The Cougars took Friday's encounter 5-4 after a tiebreaking shootout at the Co-operators Centre in Regina. 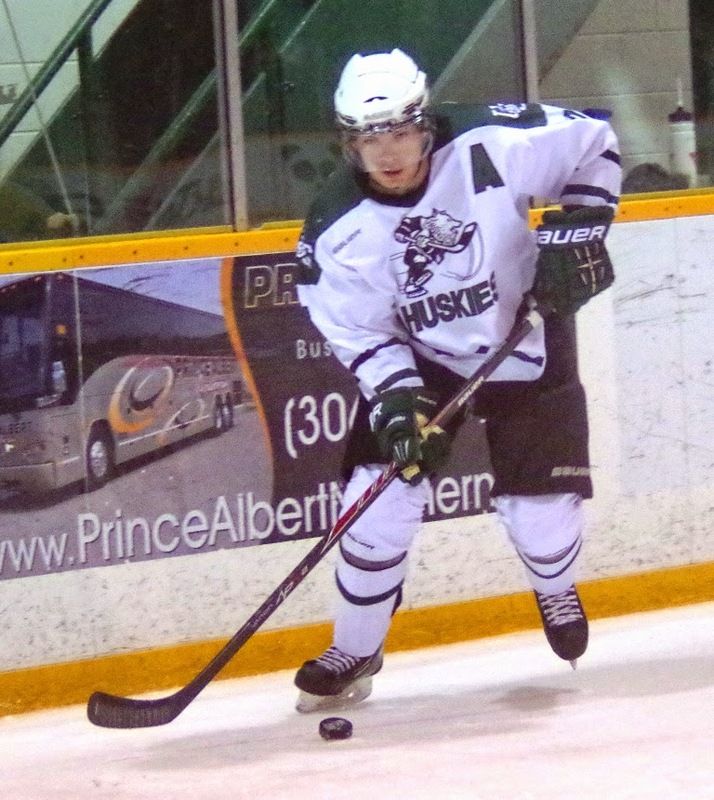 The Huskies rebounded taking Saturday's encounter at the ancient Rutherford Rink on the U of Saskatchewan campus 2-1. After the contest, it was pretty obvious the defending Canada West champs had the spring back in their steps. To put things simply, they looked like themselves. The positive vibes on the weekend started during Friday's loss. While the Cougars took the win, the Huskies did a lot of good things and could have stolen a victory on the road. The Cougars jumped out to a 2-0 lead on goals from Carleen Meszaros and Kylie Gavelin. From the point, the Kandace Cook show took over. Before the first period ended, Cook, who is playing with a broken finger, scored to pull the Huskies to within 2-1. The fifth-year forward scored twice on the power play in the second period to put the visitors up 3-2. Individually, she was putting on arguably the best individual performance seen by a player on the Huskies women's team this season. The Huskies celebrate a Kaitlin Willoughby equalizer in Regina on Friday. While the Cougars were holding a 24-10 edge in the shots on goal department after 40 minutes, the Huskies didn't appear to be in trouble holding a one-goal edge. That changed in the third. The hosts pushed back in a huge way, and the Huskies were pinned in their own zone for large parts of the third. The Cougars outshot the Huskies 17-5 in the frame and went ahead 4-3 on goals by Stephanie Sawchuk and Gavelin's second tally of the contest. It didn't appear the Huskies would get a chance to pick up the equalizer until the Cougars made an error late in the third. With 3.5 seconds to play in the third, the hosts iced the puck at a point in time they didn't really need to. On the offensive zone faceoff, the Huskies perfectly executed a play they had been working on for some time. Cook won a draw back to second-year standout Kaitlin Willoughby, who blasted home the equalizer to tie things up 4-4. The Huskies controlled play for the majority of the four-on-four and three-on-three overtime periods. They had a number of chances to net the winning goal. The best one came when feisty forward Marley Ervine wasn't able to find defender Hanna McGillivray, who was open for a backdoor pass during the three-on-three session. Cougars forward Kylee Kupper scored the only goal in the tie-breaking shootout in session's seventh round to win the contest for the hosts. Cassidy Hendricks made 39 saves over 70 minutes for the Huskies. Toni Ross turned away 17 shots over 70 minutes in goal for the Cougars. On Saturday in Saskatoon, fifth-year forward Chelsey Sundby scored in the final seconds of the first to put the Huskies up 1-0. On a power play at the 4:52 mark of the second, Ervine knocked home a loose puck near the Cougars goal to put the Huskies up 2-0. Cook and Willoughby picked up assists on the play. Before the second ended, Meghan Sherven scored for the Cougars to cut the Huskies lead to 2-1, but that score would hold up as the final outcome. Jerrica Waltz makes a save for the Huskies. In her second start, rookie Jerrica Waltz picked up her first career win for the Huskies making 28 saves in a solid performance. Jennifer Schmidt turned away 23 shots in goal for the Cougars. As far as team play and executing systems went, the Huskies had arguably their best outing in those departments on Saturday. Their forecheck proved to be really effect in the third. With a 14-10-4 record, the Huskies also edged the 15-11-2 Cougars for fifth overall in Canada West. The Huskies topped the Cougars by four points in the standings due to having a 10-6 edge in regulation wins. Regulations wins are worth three points as opposed to two points in the Canada West women's standings this season. After Saturday's victory over the Cougars, the Huskies began to turn their sights towards the Canada West playoffs. They will face the 14-9-5 U of Calgary Dinos in a best-of-three quarter-final series. Game 1 is set for this coming Saturday in Calgary. 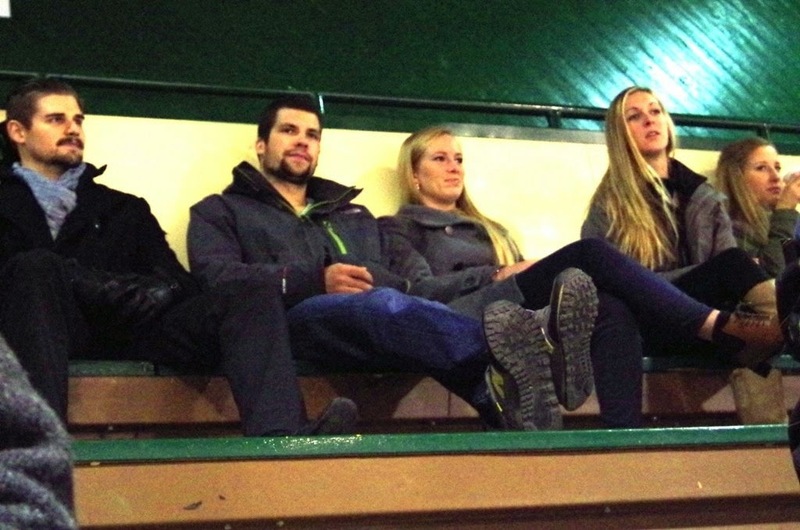 Cody Smuk and Stephanie Vause, centre, watch a Huskies game. It might go down likely as a Valentine's Day that may never be topped for Cody Smuk and Stephanie Vause. On Saturday in Saskatoon, Smuk, a former member of the Huskies men's hockey team, and Vause, a former member of the Huskies track and field team, found out they won a Dream Wedding Contest, which was organized by Crystal MacLeod of RSVP Event Design. MacLeod started the contest after her fiancé died of cancer. Smuk has been battling cancer since May of last year. He is currently undergoing 43 weeks of chemotherapy treatment. He proposed to Vause in late December, and she said, "Yes." The total package won is valued at $28,000, and the value is going up as more companies add contributions. Global News in Saskatoon did a great story on this contest, which is right here. Craig McCallum in action for the Huskies. A few shiny medals might make their rounds at various practices at the Rutherford Rink this week. A total of five players and one coach from the Huskies hockey teams were part of the Canadian squads at the 2015 Winter Universiade held in Granada, Spain. Defender Julia Flinton was part of Canada's women's team that won a silver medal. On Thursday, Canada fell 3-0 in the gold medal game to Russia. On the men's side, goaltender Ryan Holfeld, forward Craig McCallum, and defencemen Matt Delahey and Kendall McFaull helped Canada win bronze. Canada's men's team was guided by Huskies men's head coach Dave Adolph. Canada dumped the Czech Republic 6-2 in Saturday's bronze medal contest. The women's team was made up of players throughout Canadian Interuniversity Sport. The men's team was made up of players just from the Canada West Conference. 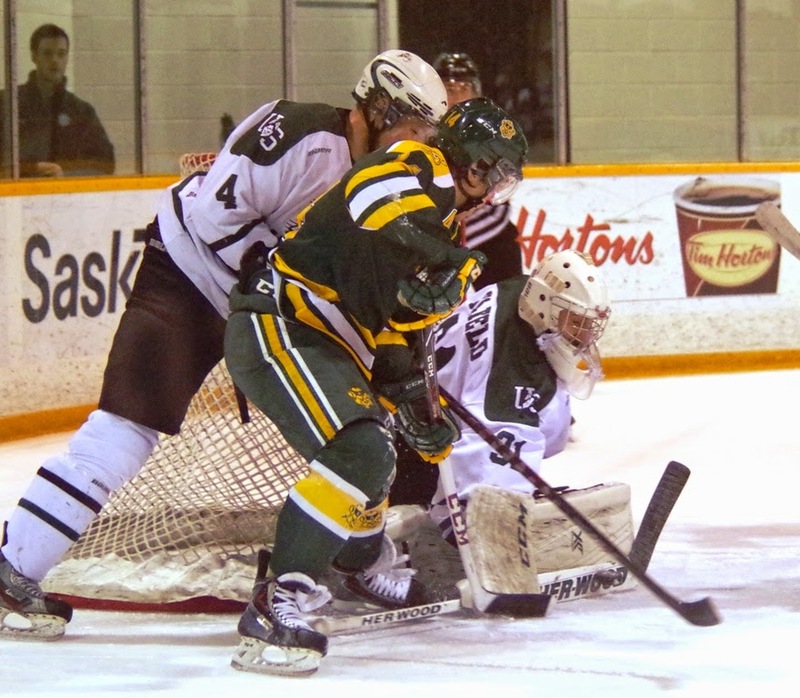 With players away in Spain, the regular season for the Canada West Conference in men's hockey concluded on Jan. 30. The Huskies return to action this coming Friday when they travel to Calgary to take on the Mount Royal Cougars in Game 1 of a best-of-three Canada West quarter-final playoff series. Nelson Nogier when he was with the Blades. The Saskatoon Blades are rolling out the red carpet for local product Nelson Nogier, who is a former member of the Blades. 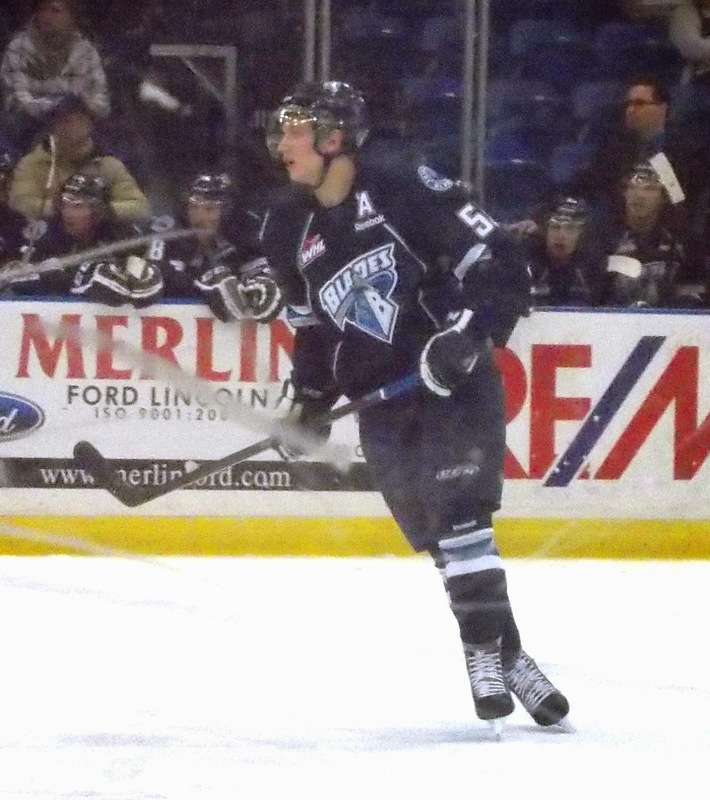 Nogier, who is an 18-year-old defenceman, spent two-and-a-half seasons with the Blades. 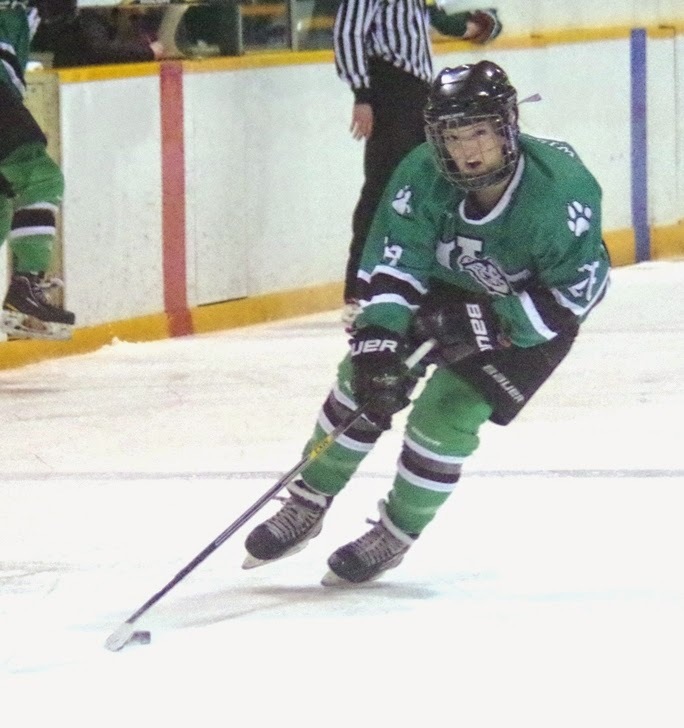 Shortly before this season's Christmas break, the Blades dealt Nogier and 18-year-old right-winger Austin Adamson to the Red Deer Rebels in exchange for 17-year-old winger Mason McCarty, a first round selection in the 2016 WHL Bantam Draft and a second round selection in the 2015 Bantam Draft. The Rebels visit Saskatoon on Wednesday for a 7 p.m. match against the Blades at the Sasktel Centre. The contest will mark Nogier's first game back in Saskatoon since the trade. In connection with the return, the Blades are giving away 2,500 Nelson Nogier bobblehead dolls to those in attendance. The doll shows Nogier in his old #55 Blades jersey. As a lot of people know, Nogier is one my young cousins, so I find the promotion cool. I never thought I would see the day a bobblehead doll would be made of a member of my family. Brooke Mutch controls the puck for the Huskies. They are a group you almost forget about. 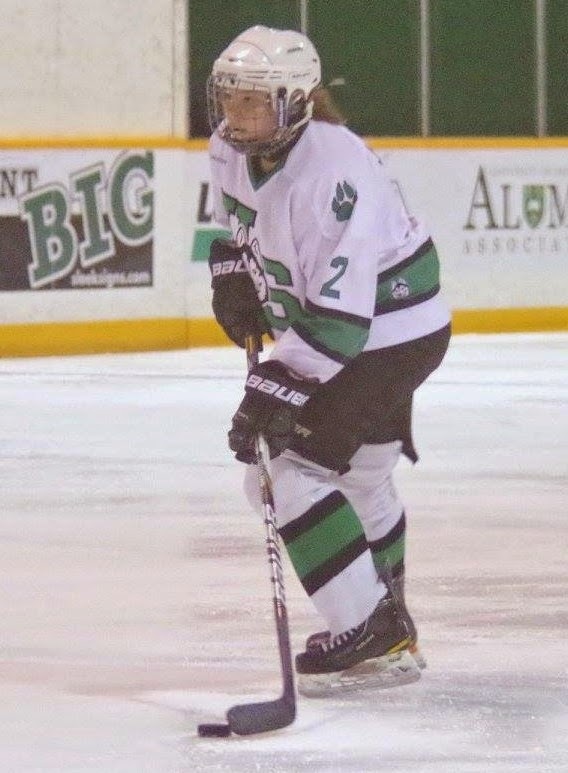 When comes to the defenders on the University of Saskatchewan Huskies women's hockey team, Julia Flinton is easiest rearguard to notice. The member of Canada's women's team at the 2015 Winter Universiade in Granada, Spain, has a unique skill set on the offensive end, which has allowed her to collect five goals and nine assists in 23 regular season games with the Dogs. Going pretty much unnoticed are the team's five defensive defenders in fourth-year veterans Brooke Mutch and Hanna McGillivray, third-year vet Alyssa Dobler and sophomores Kira Bannatyne and Brooke Patron. When it comes to locking down the action the action in their own zone, they are as good as any group in the Canada West Conference. They are also durable having only lost a combined three games to injury, when McGillivray sat out three contests with a concussion early in the second semester. As group, they have helped the Huskies give up the fourth fewest goals in the conference with 61 tallies against in 26 games. That equates to a team 2.35 goals against average. That stat is even more impressive given the fact the Huskies have scored the third fewest goals in the conference at 52. The struggles on the offensive end means there is that much more pressure placed on the defenders and the goaltenders to ensure the team still has a chance to win game in and game out. When the Huskies do get ahead by scores of 3-1 or 4-2, the defensive defenders are able to lock things down to ensure victory will be obtained. Mutch might be arguably the toughest of the defensive defenders. Her minus-10 rating in the plus-minus department is more of a product of her squad's offensive struggles and the fact she usually faces the top forwards of every opponent the Huskies face. 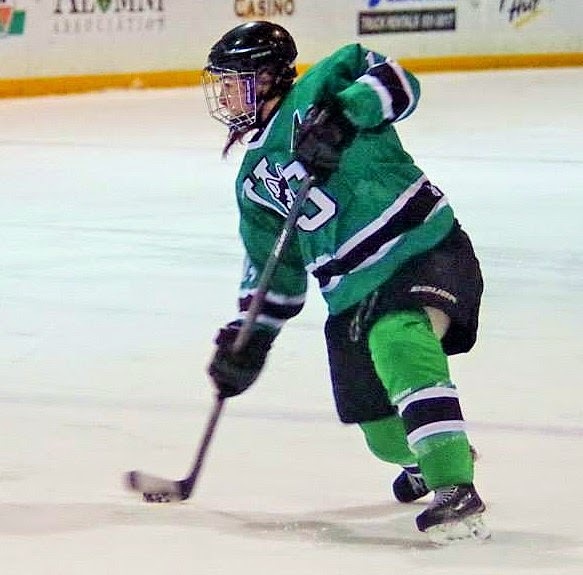 While bodychecking isn't legal in the women's game, the Nokomis, Sask., product has thrown the odd hit that has helped turn the momentum of the game around. She is also very solid, when it comes to calmly bringing the puck out of defensive zone to transition the play up ice. McGillivray is a must player you have to have on the ice when you are protecting a one-goal lead in the final minute of the third period. The Saskatoon product has a plus-one rating in 23 regular season games. The Huskies missed McGillivray's consistency when she was injured. The Dogs gave up 11 goals in the three game they played without McGillivray. Alyssa Dobler has played 94 straight games for the Huskies. Dobler has never missed a game in her career playing in 94 straight contests for the Huskies counting action in the regular season, the Canada West playoffs and last year's Canadian Interuniversity Sport championship tournament. It almost seems automatic that she will step in and play big minutes. Both Bannatyne and Patron have seen their roles increase on the team as sophomores. They have stepped to the challenge knowing they won't be healthy scratched due to the fact the Huskies only have six rearguards on their roster. If the Huskies can shake their collective jinx around the net on the offensive end, it will make their defensive defenders that much more effective. It will decreased the pressure of giving up just one goal and make it easier to play that much more calm and in control. With Mutch, McGillivray, Dobler, Bannatyne and Patron controlling things on the back end, the Huskies have to feel secure about things in their own zone. NOTES -- The Huskies (13-10-3) close the regular season with a home-and-home series with the U of Regina Cougars (14-10-2). The two teams meet Friday at 7 p.m. at the Co-operators Centre in Regina and on Saturday at 7 p.m. at the ancient Rutherford Rink on the U of Saskatchewan campus. Saturday's tilt will be senior's night for the Huskies, which means there will be some pre-game honours headed the way of fifth-year forwards Kandace Cook and Chelsey Sundby. Bob Ridley calls a Tigers game at The Arena. In what might be one of the best feel-good stories periods in sports, Medicine Hat Tigers legendary play-by-play voice Bob Ridley hit another milestone. 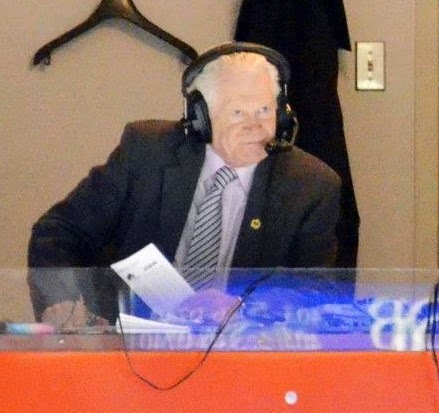 On Wednesday, Ridley called his 3,600th game as the WHL team's play-by-play voice, when the Tigers dropped a 6-3 decision to the Kootenay Ice in Cranbrook, B.C. The total includes 3,202 regular season games, 378 games in the WHL playoffs and 20 games in the Memorial Cup tournament. Over most of that stretch, Ridley has also driven the Tigers bus on road trips. With the Tigers trailing 6-1 heading into the third period, Ridley still called his classic upbeat game. When German forward Markus Eisenschmid scored for the Tabbies to cut the Ice lead to 6-3, Ridley's call made it sound like the orange and black could still make a comeback. Ridley quickly followed with the fact that there was basically less than 30 seconds to play, so you knew a rally wasn't possible. You can't help but be in awe of the total of games Ridley has called. That feeling of awe grows with every Tigers contest Ridley continues to call in the future. Saskatoon's night life will never been the same after this weekend after Beily's Ultralounge on 8th Street closes its doors forever. This will be the last weekend Beily's will be open, as it will be shut down after a 10-year run. For most of that run, it was the hotspot to be at in Saskatoon, before a whole bunch of different pubs opened up in downtown. NHL players often stopped in at Beily's. For a number of years, there was often an annual impromptu gathering there during the weekend NHLers came to town to support the annual fundraising golf tournament for the Royal University Hospital. For the longest time, it was one of the places that even as a male you would dress up classy to go out to. During most of the 10 years Beily's was open, it also was one of the few night establishments that had regular staff work there over long stretches of years. That helped attract regulars. Beily's industry nights on Sunday nights were legendary, as large numbers of staffs from the other night clubs in the Bridge City would meet for fun nights out. There will be one more of those fun nights this coming Sunday. For myself, I had a lot of memorable nights there, and I appreciated how great the staff always was. I also appreciated the fact cabs always seemed to be available at the end of the night. I think the night I was best known for being out there was a Sunday back in 2012 when I bought about 25 members of the Saskatoon Valkyries shots to celebrate one of their victories in Western Women's Canadian Football League playoffs. Cheers to Beily's. Thanks for all the great times. Jordan Nowakowski of the Huskies tips home a point. It was not the way the University of Saskatchewan Huskies men's volleyball team envisioned heading to nationals as hosts. Sitting with a 12-8 record going into their final four regular season games, the Huskies appeared to be sitting as a lock to make the playoffs in the always tough Canada West playoffs. Four losses later, the Huskies are sitting on the outside looking in as far as the Canada West post-season is concerned. When you are hosting a Canadian Interuniversity Sport championship tournament, at a minimum you want to qualify for the playoffs in your conference. You never want to go in through the back door thanks to having the host berth. Consistency has been a struggle for the Huskies all season. They have the ability to beat the best teams in Canada. 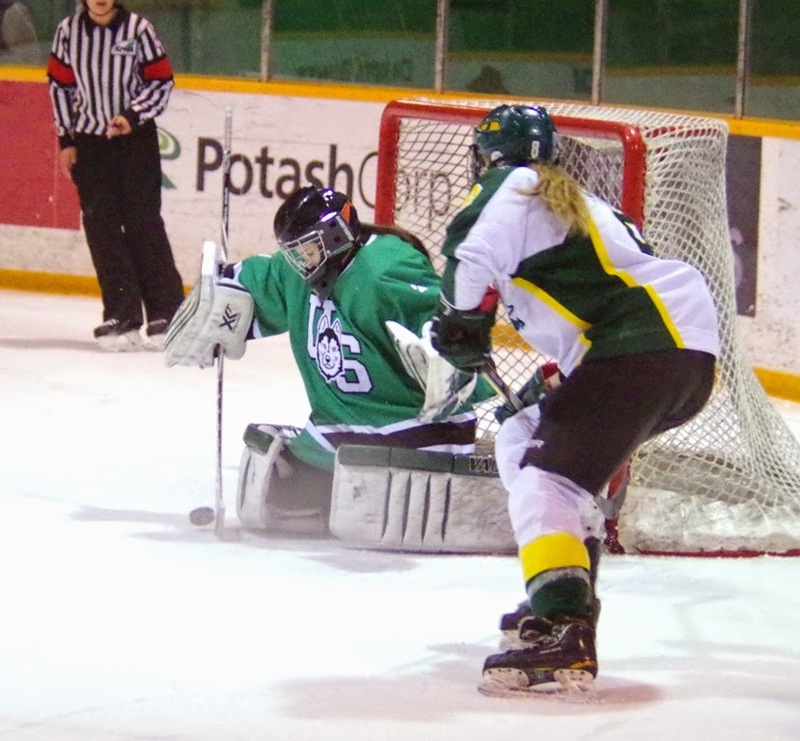 Back on Jan. 9, the Dogs looked impressive downing the 19-5 Brandon University Bobcats 3-1. The Huskies are also not good enough to pull out wins, if they are not firing on all cylinders. If you aren't at your best in the Canada West conference, you will lose. That is the bottom line. 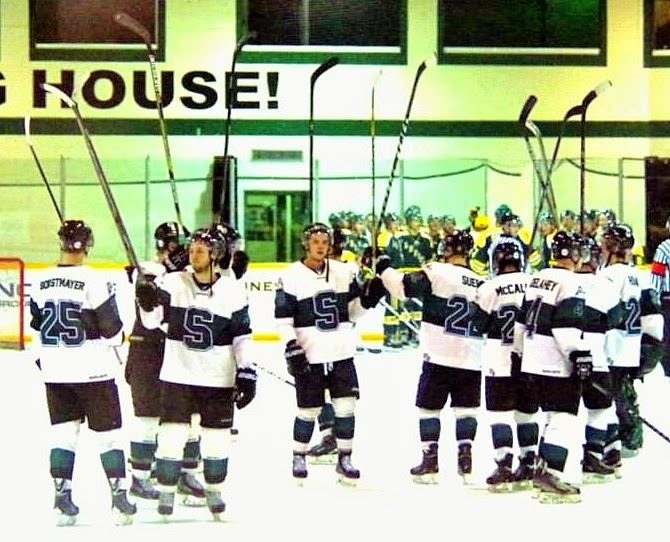 The season-ending skid for the U of S started in Langley, B.C. The Huskies dropped two games to the Trinity West University Spartans. The Spartans finished second overall in Canada West with a 20-4 record, so those games would be a big measuring stick test for the Huskies. Trinity Western took the first encounter 3-1. In the second match on Jan. 31, the Huskies took the first two sets. The Spartans rallied for a 3-2 victory. Those results shouldn't have caused any worry, as the Spartans are an elite club. It appeared the Huskies were close to playoff form. Finishing the campaign with a pair of losses at the Physical Activity Complex at the U of S to the Thompson Rivers University Wolfpack was particularly disappointing. On Friday, the Wolfpack, who were playing for their post-season lives, swept the Huskies 3-0 by scores of 30-28, 27-25 and 28-26. All of those sets were marathons, but the Huskies weren't able to summon up the will to pull any of those frames out. With both clubs sitting with 12-11 records, Saturday's encounter became for all intents and purposes a playoff game. It was also a spectacularly played match that gave local fans a glimpse of what they could expect when the U of S hosts the CIS championship tournament from Feb. 26-28. The Wolfpack took the first set 26-24, but the Huskies rebounded claiming the second and third sets 27-25 and 25-15. The victory in the second set had to be very encouraging as the Huskies found a way to pull out a close frame. The urgency on the Wolfpack's side increased. They took the fourth set 25-20 to set up a fifth and deciding set. The final set was a marathon, which saw the Huskies survive a handful of match points before falling 19-17. Troy Wiebe sets for the Huskies. Thompson Rivers' players stormed off their bench running in circles and hugging each other after the 3-2 victory. The players from the school located in Kamloops, B.C., improved to 13-11 and made the Canada West playoffs thanks to an impressive eight-game winning streak. The Wolfpack should be given top marks for their run and will likely be a problem opponent in the post-season. The mood surrounding the Huskies, who finished at 12-12, was one of huge disappointment. They will have the next couple of weekends off before returning to action at nationals likely as the eighth seed in the eight-team event. On the plus side, the Huskies will be well rested. Also, there isn't a lot of scrutiny around CIS volleyball. The Huskies aren't going to face a whole pile of criticism like the Saskatoon Blades of the WHL did when they were swept out of the first run of the playoffs as Memorial Cup hosts in 2013. When it comes time to play the CIS men's volleyball championships, the fact the Huskies missed the post-season won't be on the mind of the players and staff on the team or the fans that come out to support them. With strong fifth-year outside hitters like Paul Thomson and Matthew Busse, the Huskies are always a threat to go on a run of winning it all with a series of upset victories. 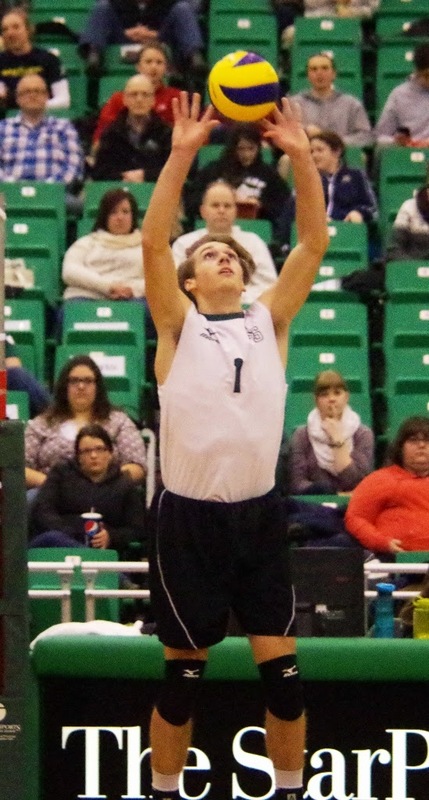 Zak Rempel and Troy Wiebe both provide strength at the setter position, and the Huskies have enough talent at the other positions to get the job done. On the other side, teams that advance through their conference playoffs to quality for nationals are more battled hardened. Post-season victories also have the ability to bond teams that much closer together. Besides having to face battle hardened opponents, the Huskies head to nationals on the downer of four straight setbacks. The combination of those two facts doesn't inspire confidence. Huskies forward Marley Ervine scoots past a Pronghorns defender. 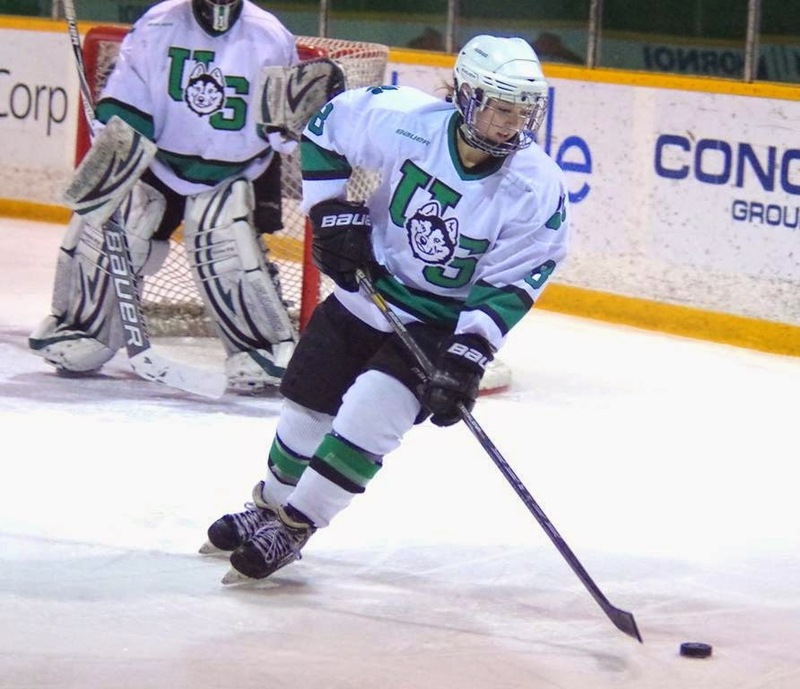 The U of S Huskies women's hockey team's first roll of the second semester was a short one lasting two games. On Friday night in Lethbridge, the Huskies won their second in a row rallying from a 2-1 deficit to pull out a 3-2 victory over the U of Lethbridge Pronghorns, who dwell in the basement of the Canada West Conference. Captain Paige Anakaer picked up the Huskies first goal, while Kandace Cook and Marley Ervine scored power-play goals in the third to pull out the victory. Ervine netted the winner at the 8:24 mark of the third, and Cook's equalizer was her team-leading 10th tally of the season. Cassidy Hendricks made 47 saves to earn the win in goal. Delaney Duchek and Chelsea Minor replied with singles for the Pronghorns. Crystal Patterson made 32 saves taking the loss in goal. The two teams combined for 28 minutes in penalties in the third period of Friday's contest. On Saturday, the host Pronghorns downed the Huskies 2-1. Sadie Lenstra gave the Pronghorns a 1-0 lead in the second period, but fifth-year veteran Chelsey Sundby netted a short-handed marker for the Huskies to even the score at 1-1 early in the third. Cora Place picked up the winner for the U of L with 2:07 to play in the third. 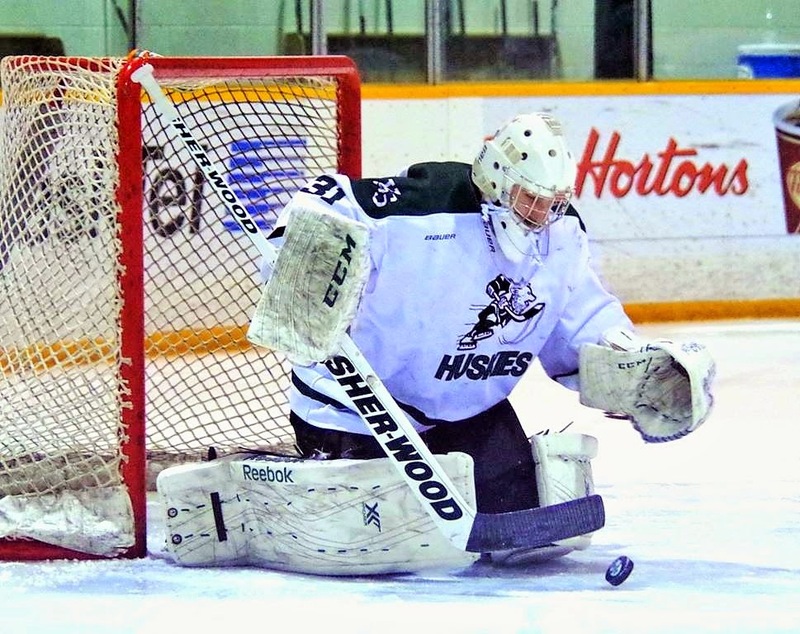 Patterson made 45 stops to earn the win in goal for the Pronghorns (5-21). Hendricks turned away 36 shots taking the loss in goal for the Huskies. The Huskies still sit fifth in the eight-team Canada West Conference with a 13-10-3 record. Since returning from the Christmas Break, the Huskies have won two out of 10 contests. The losses have piled up due to the team's struggles offensively. The Huskies 52 goals scored during the regular season is fewest among the six teams heading to the playoffs in Canada West. The Dogs have been playing with 17 skaters, which is one short of the full complement of 18. They are short staffed due to an injury to forward Rachel Johnson and forward Chelsea Wilson leaving the club due to family reasons. The Huskies are also without star defender Julia Flinton, who is playing for Canada in the 2015 Winter Universiade in Granada, Spain. As the intensity of the opposition has increased and the battles to win games have become that much tougher, one has to wonder how much the Huskies miss their captain from a season ago in Cami Wooster. She was a unique talent who brought a lengthy list of positives to the game including a natural offensive ability you either had or didn't have. That ability would allow her to score on a one-on-three rush. You just don't replace that type of player, whose absence is more noticeable when it becomes that much harder to win games. She could put the team on her back and make things happen. Everybody also loved her in that dressing room, so that makes Wooster's absence an even bigger void. As the regular season and post-season concludes, Wooster's graduation might ultimately be too much for the Huskies to overcome in the present time. The Huskies close the regular season with a home-and-home series against their provincial rivals the U of Regina Cougars, who sit sixth overall in Canada West with a 14-10-2 record. The Dogs sit two points ahead of the Cougars in the standings due to winning nine contests in regulation to better the six wins posted by the Cougars. Regulation wins in women's hockey are worth three points in the standings. The two teams meet this coming Friday at 7 p.m. at the Co-operators Centre in Regina and this coming Saturday at 7 p.m. at the ancient Rutherford Rink. If you have any feedback about this blog, feel free to email comments to stankssports@gmail.com. A Gordie Howe card from the early 1990s. Gordie Howe keeps finding a way to elbow Father Time to the ground. "Mr. Hockey" was back in his hometown area on Friday as the guest of honour for the 55th annual Saskatoon Kinsmen Sports Celebrity Dinner. He is from Floral, Sask., which is a small town just south of Saskatoon. The crowd at TCU Place gave him a warm and loud standing ovation, when he appeared to take his seat at the head table. For a moment in time, the people were engage in hero worship of an 86-year-old hockey icon who always seemed larger than life. In all accounts, it was a miracle Howe was in Saskatoon at all on Friday. Late last year, Howe, who is already battling dementia, suffered two strokes that physically hampered his ability to do anything. 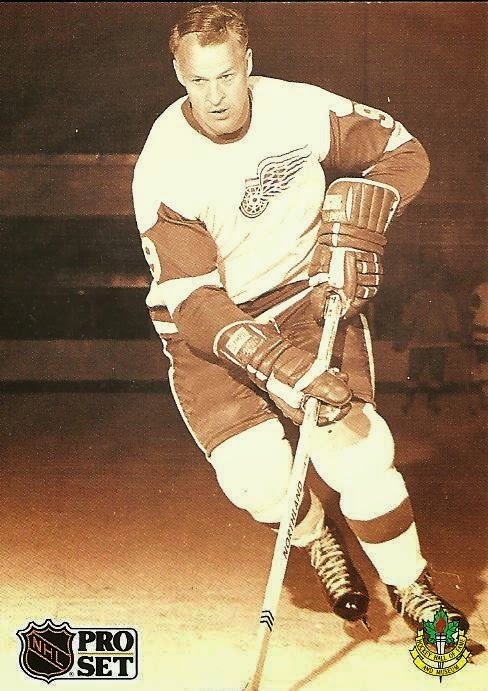 The legendary right-winger with the Detroit Red Wings was taken to Mexico for stem-cell treatments, which involved spinal injections to help fine tune his motor skills. Howe's health improve dramatically, and he was able to get move around well enough physically to be cleared to travel to Saskatoon. While his recovery to this point is amazing, a realistic awareness still existed of Howe's own mortality on this visit. The Kinsmen Sports Celebrity Dinner was billed as Howe's final public appearance. Hockey legends like Wayne Gretzky, Bobby Hull and Brett Hull all flocked to the Bridge City. 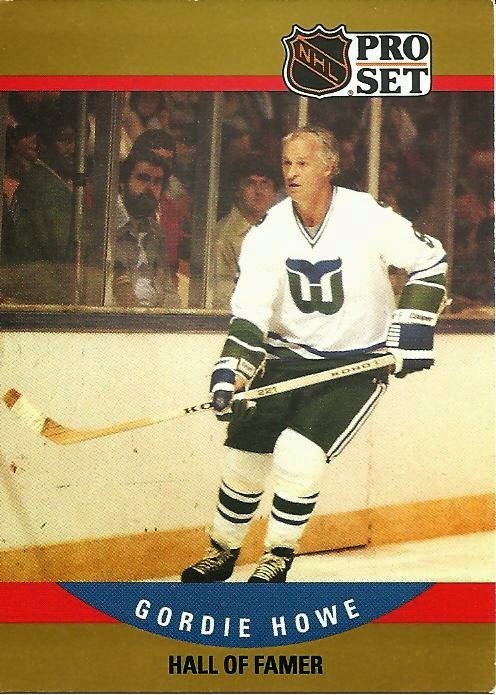 A Gordie Howe card from the 1980s. A whole pile of national medial also descended on Saskatoon for the festivities. Most media were barred from the dinner itself, which also proved to be another sign that Howe's health wasn't the greatest. Daniel Nugent-Bowman of The StarPhoenix in Saskatoon was one of the few media members allowed into the dinner. He wrote that Howe appeared overwhelmed by the mob of people that clamoured around him looking for the perfect mobile phone picture, when the man who played 32 professional seasons in both the NHL and WHA first appeared. Nugent-Bowman said Howe stumbled slightly and his son Murray took hold of him. Howe regained his balance and flashed a quick smile. If Howe had some difficulties there, you can only imagine what it would have been like had a horde of media followed his every move. Howe was looking good from pictures and videos that are available over various platforms from that night, but he also looked frail too. He definitely did not look like the man who took the ice in his final full professional season in 1979-80 to thunderous ovations dressing for the NHL's Hartford Whalers. Those ovations often turned to boos in opposing rinks, when at age 51 he would elbow an opponent and start an incident. He also collected 15 goals and 26 assists, while playing all 80 regular season games in that campaign for the Whalers, which is also mind-boggling to think about. A Gordie Howe card from the 1990s. 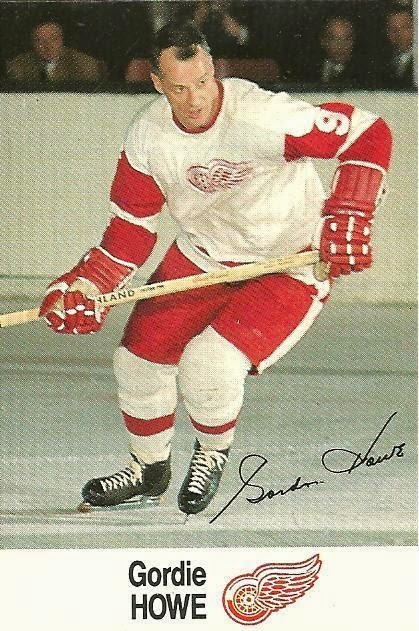 That was also the beauty of Gordie Howe. In fantasy, he was ageless. He was named the NHL's most valuable player six times, and after two years of his first retirement, he returned to play in the rebel WHA league for the 1973-74 season with the Houston Aeros to be teammates with sons Mark and Marty. After piling up 31 goals and 69 assists in 70 regular season games in that campaign, Gordie Howe was named the WHA's most valuable player. He helped the Aeros win the Avco Cup as league champions in 1974 and 1975. The visit in Saskatoon was a big nostalgia trip. For one night, all those that idolized Howe still saw him lighting up the scoreboard offensively, sticking up for his teammates when the going got rough and winning four Stanley Cup titles with the Red Wings. The night also saw Howe gain another honour as the Kinsmen Arena was renamed Gordie Howe Kinsmen Arena. It also seems everyone has their own story about meeting Gordie Howe. He might not be his best as far as health is concerned, but that hasn't diminished how he is viewed. As was seen on Friday night in Saskatoon, the image of Gordie Howe – the larger than life hero – lives on. Iconic Patriots quarterback Tom Brady. The talking point of the Super Bowl revolves around one play, but give the New England Patriots credit for making it. With time ticking down, it appeared the Seattle Seahawks were going to pull out victory after a two-minute drill drive. Facing a second and goal on the New England one yard line, Seahawks quarterback Russell Wilson tried to hit receiver Ricardo Lockette on a quick slant. Patriots defensive back Malcolm Butler saw what was happening, jumped the route and made a game-saving interception to give New England a 28-24 victory in Super Bowl XLIX. Right after the game checking out social media in any form, a large number of Seahawks fans were expressing their shock that their team didn’t hand the ball off to running back Marshawn Lynch. He had 102 yards rushing on 24 carries and had scored one rushing major already. If he was stopped, the Seahawks had a timeout to stop the clock. Had Lockette fought for the ball and made a game-winning touchdown catch, no one would be second guessing Seattle’s coaches. Coaching staffs in the NFL put in tonnes of research time to try and hit an opponent with something unexpected. A pass in that situation on second down isn’t something you would not expect. With that said, Lynch is arguably the Seahawks’ best player, and normally you put the ball in the hands of your best player, when the game is on the line. The fact the Seahawks didn’t run the ball with Lynch shouldn’t take away from the Patriots victory. They made the interception play when they had to and took their fourth Super Bowl title. Iconic quarterback Tom Brady, who is just so pretty, rallied the Patriots from a 24-14 fourth quarter deficit against the best defence in the NFL this season. 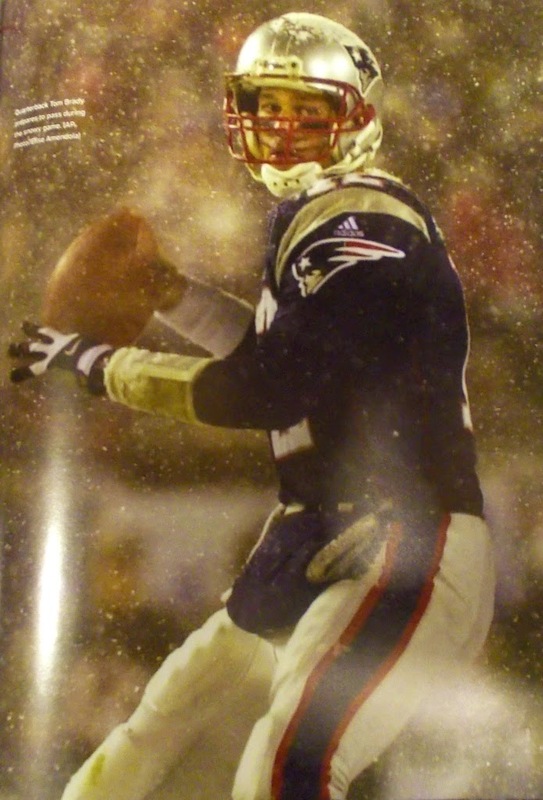 In winning his third Super Bowl MVP award, Brady completed 37 of 50 passes for 328 yards and four touchdown strikes. He made the effects of the two interceptions he threw earlier in the contest go away. On top of that, Brady joins Terry Bradshaw of the Pittsburgh Steelers and Joe Montana of the San Francisco 49ers as the only quarterbacks to win four Super Bowl titles as a starter. With New England’s defence coming up with the big interception to save the final outcome, the victory was a team win. During their victory celebrations, most of their players will be able to point to a play they made to ensure the final outcome came out in their favour.